Do Cash Purchases Yield a Healthier Diet? With the opening of this season’s farmers markets, I find myself withdrawing more cash from my ATM — and more cash each week. The vendors do not accept checks or credit cards, so we patrons have to plan ahead or pay nasty surcharges when we run out of money during the middle of a market run and need replenishment from a nearby ATM (although a shout-out to WaWa by my beloved Headhouse Square Farmers’ Market at 2nd and Pine in Philadelphia for not charging extra for cash withdrawals from non-bank members). The consolation is that I spend less at Whole Foods and the other large food chains on my regular shopping rounds. But does this need to use cash have a deterrence on my total spending budget? Peter Smith reported recently that it might. “According to a new study reported in the Journal of Consumer Research (subscription required), credit card use may mediate the pain of parting of our hard-earned money.” Manoj Thomas, a marketing professor at Cornell, examined the spending habits of 1,000 shoppers at one chain grocery store. After collecting data over a 6-month period, he found that credit or debit card use contributed to impulsive purchases of “vice products.” Thomas and his colleagues speculated that paying with plastic is “emotionally more inert” and “abstract.” Paying with cash is immediate and tactile. Smith also cites Dan Ariely’s 2010 book, Predictably Irrational: The Hidden Forces That Shape Our Decisions in which the author recommended the use of “self-control credit cards” with a $50 limit on impulse purchases. Or the feedback aid of a credit card that displays the debt as soon as a transaction has been enacted. Me, I use my credit card merely as a bookkeeping tool, as my husband and I pay off the full amount each month, never even bothering to remember what our bank charges for interest payments. Yes, I do find it easy to ring up purchases at Whole Foods. When I shop at my two farmers’ markets (Sundays and Thursdays to carry us through the week and for Shabbat), I see how much money I put in my pocket and how much I hand over to each vendor. And I do feel a pang when I have to detour to the ATM because the maple syrup vendor appears (after a disastrous sap season in 2010) and I want to spend more than I’d allocated for that week. For me, a conscious locavore, spending cash for local fruits and vegetables means that my family is eating food that is as fresh as can be (often harvested early that morning!). A different argument might be posed for families living on the brink of poverty. Their government-supported food stamps — whether through SNAP (Supplemental Nutrition Assistance Program), TANF (Temporary Assistance For Needy Families), or WIC (Women, Infants and Children) — are often not accepted by the small-scale vendors at farmers’ markets. Around the country, most SNAP clients use an EBT (Electronic Benefits Transfer) Access card at approved grocery stores, where the amount of a purchase is automatically deducted from the monthly allowance. 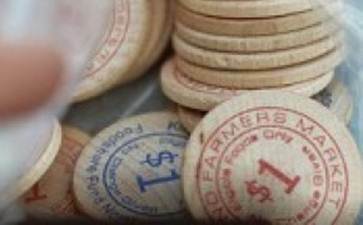 This presents a challenge for farmer’s market vendors who do not usually accept credit cards. However, many markets around the country are setting up EBT stations where folks with snap benefits can transfer their electronic benefits for tokens that the farmers will be able to accept. In my advocacy work with refugees (families being resettled here by the Hebrew Immigrant Aid Society (HIAS)), I’ve learned that there is often a steep learning curve for these new arrivals in budgeting via a plastic accounting system. There is also the temptation of many new “food” products never before imagined in their native countries. Finally, many poor families — though not my refugees — live in “food deserts” where they have to rely on small stores, known as bodegas in cities with a large Hispanic population, that do not offer much choice in fresh produce. For people in various economic situations, cash payments do not necessarily result in a healthier diet. While I have the luxury of being able to afford my weekly trips to the farmer’s market, I understand that not everyone is able to or has the access to fresh healthy food like this. Hannah Lee writes from her home in Pennsylvania, in between taking care of her family, her shul, and the refugees being resettled by HIAS.